For almost three decades Nautronic has provided the world with electronic scoreboards making the spectator experience at sporting events even more exciting. 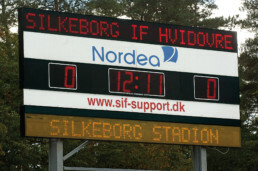 The company was founded by Per Nautrup and has provided high quality scoreboards since the beginning. Back in 1984 Mr. Per Nautrup was working as an electronics technician when he was asked to make an electronic scoreboard for the sports hall in a local school. Mr. Nautrup saw the request as a challenge and agreed to do it. He was working in his own home to finish the scoreboard and once it was finished he had a number of ideas for things that could have been done differently. These ideas founded the urge to always improve that has run and developed the company of Nautronic ever since. In 1984 the first scoreboards were made. Back then the lights were regular bulbs and the scoreboards were sold only in the national market of Denmark. Soon the scoreboards spoke for themselves and the word spread so requests from the neighboring countries started coming in. 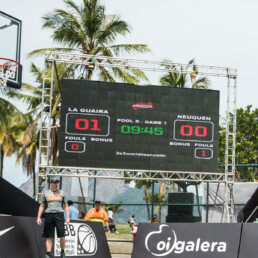 The scoreboards were mainly sold for handball and other similar team sports in the beginning, but after a short time the demand of scoreboards for basketball and timers for swimming helped broaden the range. In 1989 the first scoreboards were sold outside Denmark. Sweden and Norway were the first export markets for Nautronic and a tradition for exporting a great deal of the products was started. It was also in this period in the late eighties that the regular bulbs were replaced by light diodes. With the export for Scandinavia the word spread again and in 1993 the cooperation with Schelde Sports in Belgium was started. The first project was installed in Mons, Belgium, but with the international operations and network of Schelde Nautronic scoreboards were soon installed in places like Pakistan, Tunisia, Romania, Germany and Turkey as well. 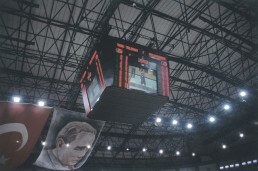 In 1997 Nautronic entered the cooperation with FIBA making the scoreboards fulfill FIBA regulations. In 2007 Nautronic was certified as study center partner and in 2013 the cooperation took on entirely new dimensions with a three year FIBA 3×3 World Tour sponsorship deal making Nautronic exclusive supplier for the World Tour events. Over the years Nautronic has supplied the world of sports with scoreboards for team sports like handball, basketball, volleyball and futsal for the indoors but also for individual sports like badminton, tennis, gymnastics and weightlifting. For outdoor use a line of football scoreboards is available counting both fixed and mobile installations. For the outdoors Nautronic has developed scoreboards upon request for cricket and American football, but also swim timers and multi timers for sports like track and rowing. A range for swimming and water polo has been developed and many special requests such as scoreboards for pelota and squash have equally added to the range. Whereas Nautronic based its international exports on a few large distributors in the beginning it is taking care of international sales with its own sales department and a network of dealers now-a-days. Nautronic has dealers in more than 50 countries and have installed scoreboards on all continents counting over 90 countries. Nautronic passed 10.000 units installed in the spring of 2013. From the beginning Nautronic scoreboards were controlled by a mechanical control panel called …… It had a wooden frame and very few buttons to push. Along the way the control panel was redesigned to add more possible functions. In 1998 the NT-pult was launched. Up until this point all communication had been wired, but suddenly a wireless connection was possible. Also the NT-pult was the start of the scoreboards being programmed and run on software instead of mechanical buttons. In 2010 the new generation of the scoreboards was put into production and in 2013 the conversion to the new generation was completed as the NAUCON-1000 control panel was made standard. With this control panel a much more flawless wireless communication was possible and the control panel can even run a text display as it has a full color touch screen that can show the keyboard. An adaption for the new needs for commercializing the sports halls and giving the local clubs the possibility to sell advertising and promote the successes of key players.